Luke Cole scored twice as Racing Club cruised past Cadbury Athletic 4-1. Racing Club began a run of three home games in five days with a comfortable victory over Cadbury on Tuesday. With several players out through injury, manager Scott Easterlow was forced to shuffle his pack again, with Martin Hutchcox returning to the starting line-up after missing the trip to Walsall Wood and Ryan Billington and Elliott Powell in the full-back positions. Racing Club started brightly but had to wait until the 24th minute to break the deadlock, Wade Malley putting in a cross that bisected the back four to allow Luke Cole to slot home. Cadbury equalised two minutes later with a fierce dipping strike from Romario Rose. However, they were only level for two minutes, with Lewis Hudson producing a fine ball to the far post that was finished off by Luke Church. With Alex Price and Henry Leaver pulling the strings in the middle of the park and Hudson and Church providing width, Racers deservedly pulled further ahead in the 43rd minute, Luke Cole getting his second after an assist from Henry Leaver. 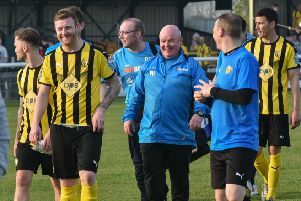 Malley stung the Cadbury keeper’s hands early in the second half and Racing Club put the game out of reach in the 71st minute when Hudson fired in a rasping strike that went in off the crossbar. Racing continue their quest for a top-four finish tonight with a home game against Leicester Road before entertaining fellow high-flyers Hinckley on Saturday.